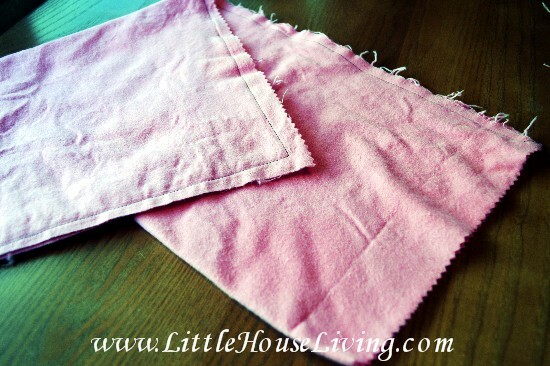 Homemade Heating Pad - How to Make a Super Easy Homemade Heating Pad! Sometime right around the first part of the year I did something to injure my shoulders. I’d been having issues for a while and then all of the sudden I was out of commission from serious back pain for about a week and then still hurt for another week. Thanks to several issues that cause inflammation in my body, my chiropractor told me it’s going to be an on-going issue and something I’ll need to deal with. In addition to some new supplements and treatments I’ve been using even more ice and heat (I’m supposed to alternate both) on my shoulder area. 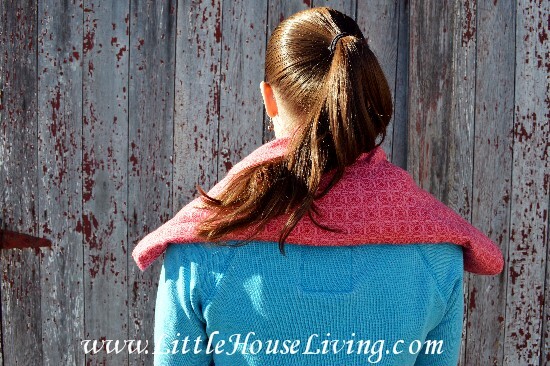 Have you ever tried to use a heating pad or an ice pack on your shoulders? It just doesn’t work! It’s an awkward shape and doesn’t fit snugly around the area you need it to. After having great success with making my own Homemade Hand Warmers last month I decided that a full homemade Heating Pad wouldn’t be that difficult. And it’s not! This project takes about 30 minutes, start to finish. I even made a nice little cover for mine so if it gets dirty I can just toss the cover in the wash. Another reason I love this project is because you can use fabric scraps! 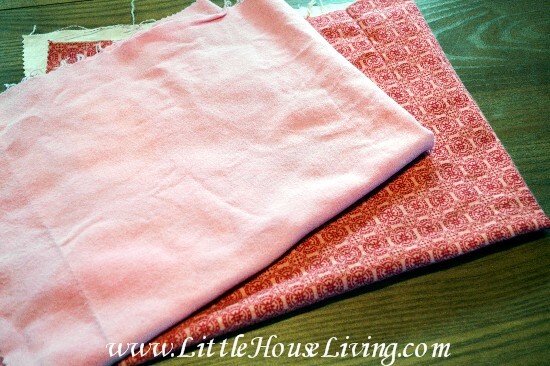 Start with 2 pieces of cotton flannel fabric. Make sure you are using cotton and make sure it doesn’t have any metallic in the fabric otherwise your microwave will not be happy with you. (I got mine from Fabric.com)For the cover, you need a piece of flannel that is 24 long by 18 inches wide. 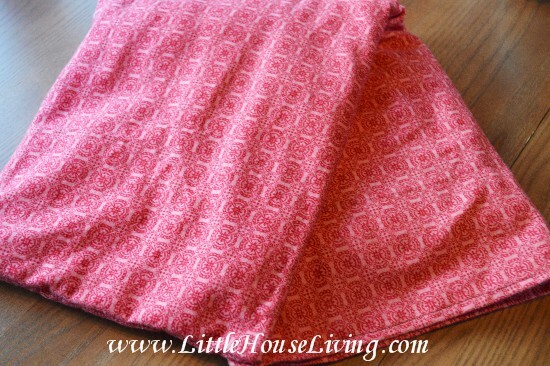 For the heating pad you will measure a piece of flannel that is 22 inches long by 16 inches wide. For the heating pad, fold the fabric is half the long way (so now it’s 22 inches by 8 inches folded over) with the wrong sides out. 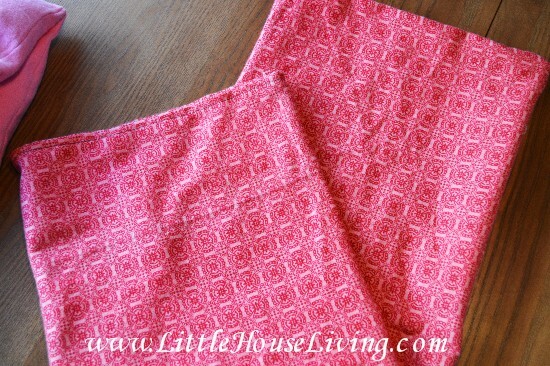 Sew along one short side and one long side, just like you are making a pillowcase. Turn it inside out when you are done. Make a mark with a fabric pencil every 5 1/2 inches. 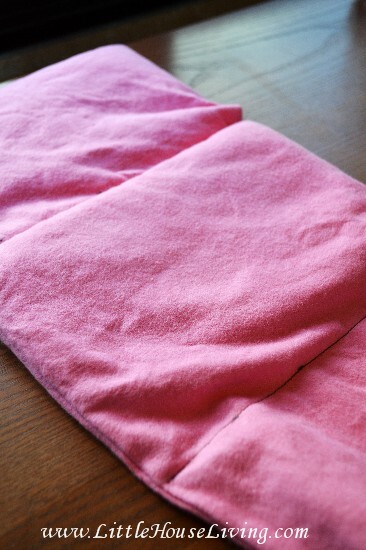 This will help you sew in a straight line the 4 different sections of the heating pad. Fill the bottom of the heating pad bag with 1 1/2 cups of rice. Sew along the first line you made. Fill the next section with another 1 1/2 cups of rice, sew again, repeat for the 3rd and 4th sections. 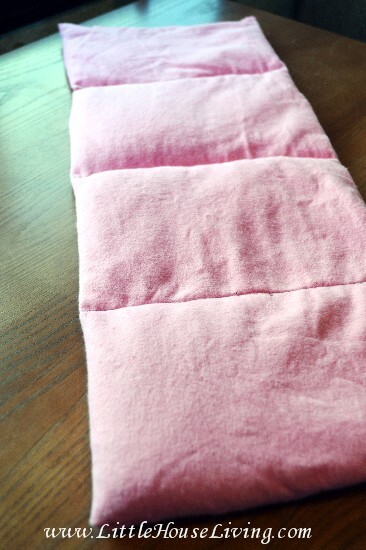 Finished heating pad! Set this aside for a moment. 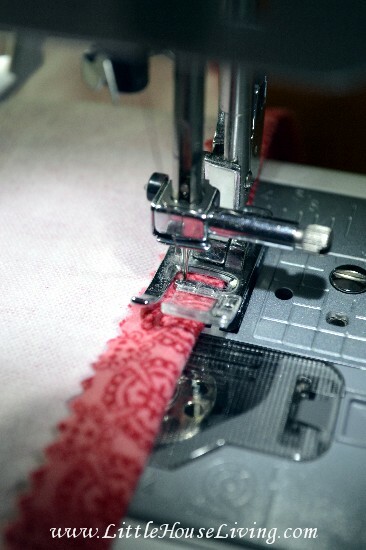 Take your other piece of fabric (for the cover) and on one of the shorter (18 inch) ends, sew a hem. 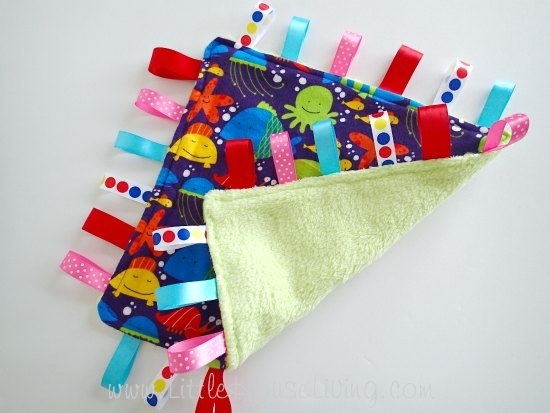 Then do the exact same for the cover as you did with the heating pad, sew on the wrong side in a pillowcase shape, leaving the hemmed end open. Once it’s finished, take the heating pad and slip it in to the cover (just like you would with a pillow into a pillowcase) and you are done! The makes a nice long heating pad. Perfect for putting right over your shoulders and neck. 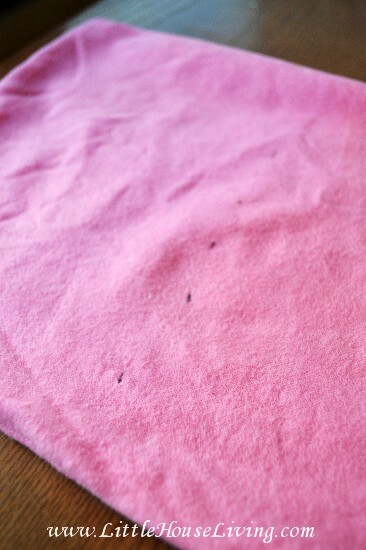 Whenever it needs to be washed simply slip the pad out of the cover and wash the cover with your other clothing. 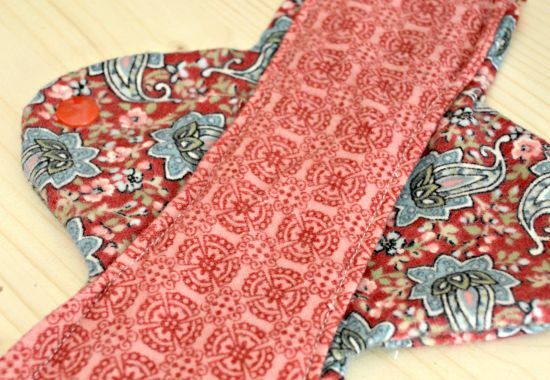 Make the smaller version of this homemade heating pad perfect for pockets…Homemade Hand Warmers! LOVE your fabric. If you can find 100% cotton corduroy, it works well too. I’ve made similar bags, and I can tell you from experience, you definitely want those sections in your bag! 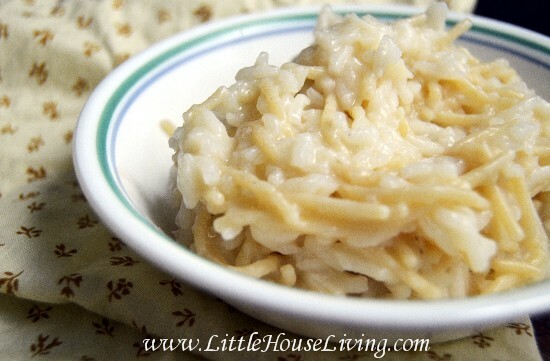 The rice shifts around too much in the ones I’ve made without them. It’s impossible to form the rice around your shoulders because it all winds up in the ends instead. These are great! I’ve made one of these before. Next time I will use flannel so it dosen’t slide around as much. I over-filled mine, thinking it would be stay hotter longer, but it just made it more cumbersome. One tip. My chiropractor said moist heat penetrates better that dry heat. I squirt my heat pad with the squirt bottle a few times before heating it. Sometimes I even dribble water on it from the faucet of the spray bottle isnt handy. You could moisten it after words instead, but i think it helps before hand more. If you are worried about mold, think how quickly rice grains will dry back out when you have some cooked rice crumbs on your counter. I’ve never had a problem with it. Thanks for this tutorial, I have misplaced mine and need another one. A friend who worked at a physical therapy office said oatmeal will hold the heat better than rice, haven’t tried it but its worth a shot!! We have told dozens of people about this oil and they always come back and thank us. Not only does it relieve the pain but it heals the tissue and bones. I have used the legs of jeans to make rice bags and they hold up very well. We have a drawer full of various sizes and shapes of rice bags. They are great! love how simple and easy this is to do! I love this! I just made myself a “bear skin rug” heat pad. My kids liked it so much they stole it from me! Guess I’ll have to get more material and make more. Thanks for all your sharing. My husband and I love reading your posts. I’ve made a “heating sock” like this for my labors. And I loved them! They’re better than anything you can buy. Hi Merissa, How kind of you to take the time to do this tutorial when you are obviously so very busy trying to get your home completed. I really appreciate that. I will print out your directions and will make some for gifts as well. What a handy and very nice gift to give to friends who have shoulder and neck problems and I guess that is many of us. I think this would be excellent for the small of the back when sitting in a chair if you have back problems. All in all a terrific idea. I enjoy your blog so much and love reading what you are doing. I do hope you have a pleasant spring and summer after all the bad weather that has been happening over on your side of the world. Our Autumn had been quite pleasant so far and I hope that we don’t get the extreme winter here in Australia that you had. Our summer was very dry and many of our farmers and graziers are experiencing bad drought conditions. Oh wow, I could totally use this right now. You’re right, traditional heating pads are not a good fit. I made a rice bag to fit around the lower back. It is in sections too. I put ties on it so it can be worn while moving around. My housekeeper loved it and it doesn’t show under her uniform! 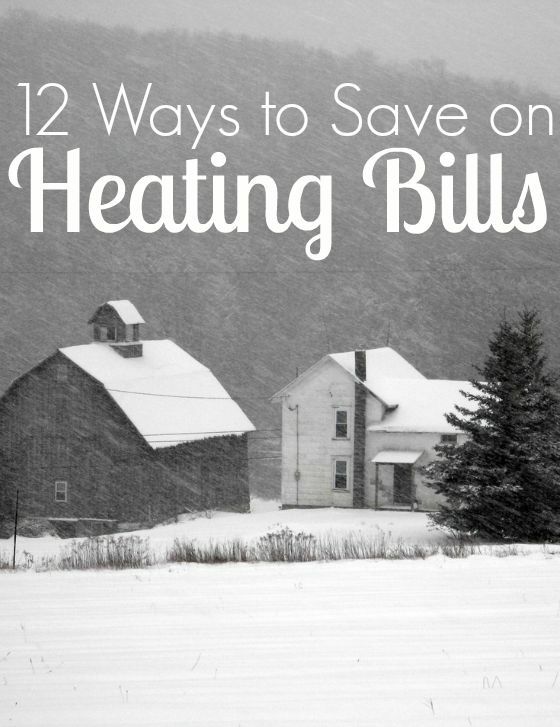 She reheats it at intervals and at other clients homes. It can be tied around the shoulders too. Looks like a chubby apron! Lol! Thank you for including heating instructions not using a microwave as I don’t use one. I love using a hot water bottle but the quality has decreased so much over the years that I seldom find one that lasts even 1 year. It is so annoying to bring one to bed and the water leaks out. Not only do I not get the heat but I have to soak up all the water! Have you tried flax seed? I’ve read that it actually works better than rice and holds the heat longer. We use it in socks and it does a very good job. I want a heating pad that doesn’t need a microwave, since I don’t use one. I like hot water bottles but they are unreliable. The last one I bought didn’t last 6 months before it sprang a leak. Soaked bedding and a cold body do not fit well together. You could always heat this up on the top of a warm stove. Thank you for sharing. I just signed up for your weekly newsletter…i love everything I am reading. I will try the hand warmers…a Aunt of ours gave me a sock heatingpad…i love the fact it is mobile…but i love your version of a heating pad which i will try. Love your site…blessings Connie Cool. I hope to make this soon too. I plan on throwing it in my bed to warm up the sheets before I climb in. BTW…fantastic website! I shared with my daughter, and she just signed up too! She’s as excited about your site as I am. One caution . . .
Keep your rice out of the way when you sew. Do NOT try to sew over the rice. I broke three needles as I was making some of these for Christmas gifts. Who knew rice was so hard?! You can throw some dried herbs or spices in with the rice, and it will give off a lovely smell each time you heat it. Cloves? Lavender? Mint? Nutmeg? Sounds so great. I have a DEAR Father whose shoulders are soooo sore from torn rotator cuffs. SO, I am going to give this a whirl — does it work better for a man a bit larger? He HATES HEATING PADS! Hope this helps him — we all love him so much! This is quite large on me but I’m a pretty small person so you may want to make it a little bigger for a man so he will be able to drape it over his shoulders. I think he will love this…the heat is so much nicer than a regular heating pad! I came over from Creating my Way to Success link. I had never seen a tutorial on doing a heating pad this way. Your tutorial is very clear and concise. 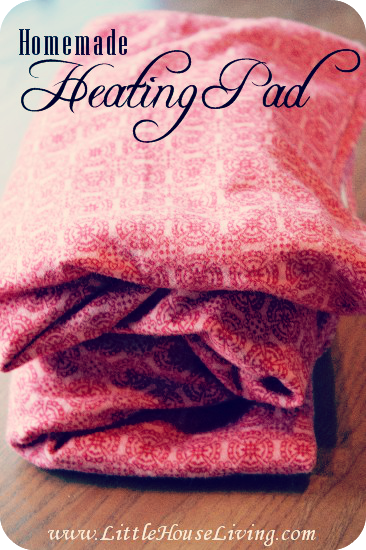 Thank you for sharing it and let’s hear it for easing aches and pains away with a homemade heating pad! This is an excellent tutorial! Thanks so much for taking the time to share exactly how to do it! I also love the idea by one of the commenters on using a pair of old jeans! ive made mine many years ago. I added ties to the short ends so I can tie it on diagonally over my shoulder or around the small of my back etc. and I can move around with it on. Given a number of friends the tie on version being in that age group! My daughter is making the handwarmers, and now this (thank you thank you) as a home school project. Do you find that the rice smells or needs replaced often? She’s considering using some velcro to be able to change out the rice. I can’t believe I am the only one who doesn’t have (or want) a microwave. Surely there is a way to make heating pads in the oven. Can you help?